In London, a surprise is waiting around every corner. What started out as a routine trip to get groceries turned into an awesome little jaunt into the local art scene. 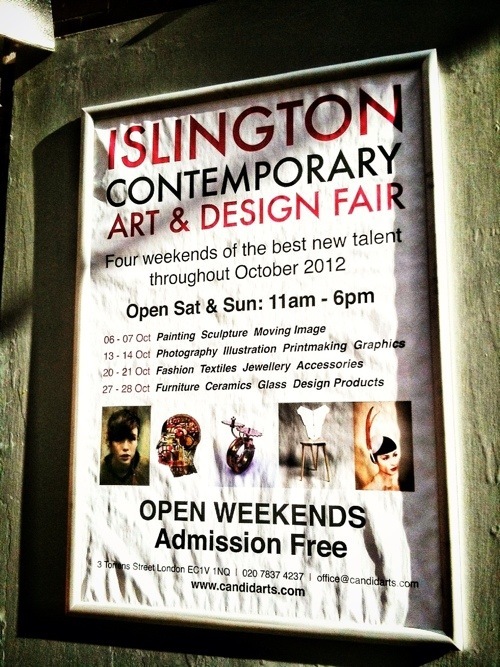 I had gotten off of my bus that brings me close to the supermarket, Sainsburys, when I saw a poster for the Islington Contemporary Art and Design Fair. I thought that sounded pretty awesome, so I followed the signs to a local gallery/artspace. Inside, I found a small collection of local artists selling their works from stands and explaining their work processes to anyone who was interested. I struck up a particularly interesting conversation with a local printmaker who had some amazing prints and t-shirts. I also found something else awesome in the gallery: a flyer that proclaimed that drop-in art lessons on weekday evenings were starting up soon. Even better? They are only £7, which is about what a lunch out costs. I am really excited to try out these classes and become a better artist.